The Monterey Bay Aquarium is one of the top aquariums in the world, and it's only an hour and a half drive south of San Francisco! It sits on the northern end of the historic Cannery Row district in the cute seaside town of Monterey, CA. During your visit, you will get the chance to see and learn about dozens of animals from penguins to stingrays. They also have several hands-on exhibits, including touch pools, as well as the largest indoor kelp aquarium in the world. Here are a few more details on each of the top exhibits currently on display. Giant Pacific Octopus: Watch this intellectual creature open jars, play with toys, and even recognize the aquarists. 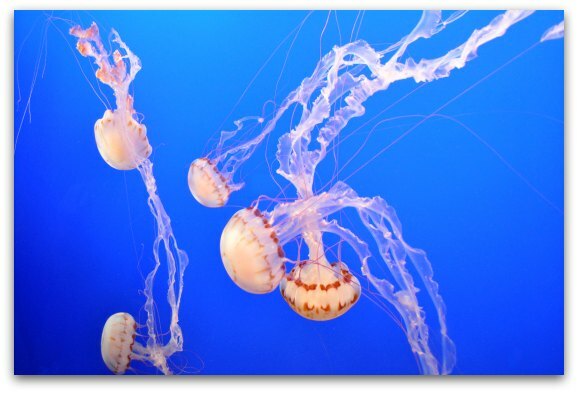 The Jellies Experience: See several species of jellies dance, glow, bloom, and sting. Kelp Forest: Look up at the 28-foot-tall kelp forest and watch several animals as they weave their way around these massive plants. Life on the Bay: Step outside for a glimpse at the Monterey Bay and the animals that call it home. Open Sea: Take a seat and watch the constant movement of the aquarium's largest exhibit. Sea Otters: Enjoy the playful nature of these cuties as they tumble, splash, and wrestle around in the water. 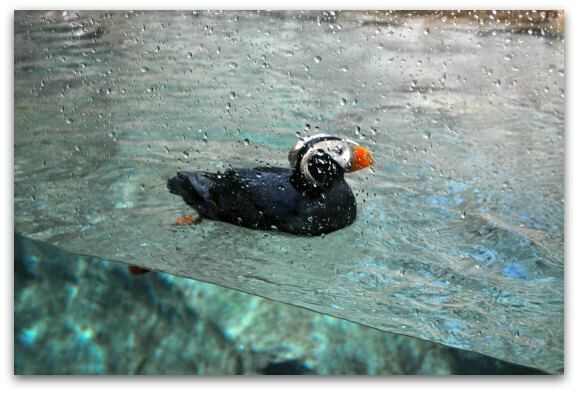 Splash Zone & Penguins: Watch the penguins waddle around, and interact with 45 new and improved bilingual exhibits in the Splash Zone. The Monterey Bay Aquarium can get very crowded. The high season is during the summer months, especially on the weekends. However, I find that even when it's busy, I can still make my way in to see the displays--with some patience and a little more time to get through the crowds. The best time to visit is during the off-season. This is during the fall and winter months (minus any holidays). If you are visiting during high season, you can plan ahead to avoid peak times and days. Most visitors make their way over to the Monterey Bay Aquarium during the morning hours, so you will find fewer people between 2pm and 6pm. You will also find fewer visitors on Tuesday, Wednesday, and Thursday. The Monterey Bay Aquarium is a non-profit organization. All the proceeds from admissions go to support research, development, and day-to-day maintenance. This means that they rarely offer discounts or coupons for admissions. Active & Retired Military: All active and retired military with ID will receive discounts at the door. You can also receive discounts for your entire group when you purchase in advance through a military base. Monterey Office: 53 Soledad Drive at Pacific Street, Monterey, CA; Hours are Monday - Friday, 9am - 5pm. San Francisco Financial District Office: 160 Sutter Street at Kearny, San Francisco, CA; Hours are Monday - Friday, 8:30am - 5:30pm. In the past, many local hotels offered a two-day pass to the Monterey Bay Aquarium for the price of one day's admission. As this attraction continues to gain popularity, fewer hotels offer this option. However, make sure you inquire at your hotel to see if they sell these passes. If so, it gives you the opportunity to visit the aquarium over the course of two days. If you don't quality for or aren't able to take advantage of these other Monterey Bay Aquarium discount tickets, then you will want to buy your ticket in advance. This allows you to skip the ticket line and head to the admissions door right away. This option saves you time as the ticket line will sometimes take up to an hour. Buy your tickets online today. Read recent guest reviews and find the lowest prices for these and other Monterey area hotels on TripAdvisor.com today!